Highly-rated Jason Field is back at the DWB Stadium. The return of the left-sided player after a spell at Northern Premier League side Lincoln United is a huge boost for the Poachers following the departure of Nick Jackson. 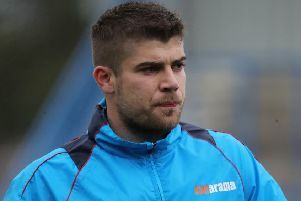 Field first joined the Poachers in 2012 on loan from neighbours Boston United after having been part of the Pilgrims’ first team squad. He has played 49 times for Boston Town over the past three years and can play in midfield as well as defence. There is also a new face on the club’s coaching team, with the arrival of Leighton Atkin. Mark Angel has strengthened his coaching team with the addition of the vastly-experienced Atkin. A former England schoolboy trialist, he played for Holbeach,Yaxley, Bourne, Wyberton, Grimsby Town,Sheffield Utd, Halifax Town and Scunthorpe. Atkin has level 1, 2 and 3 coaching qualifications, as well as his UEFA B-module 1. Clubs he’s coached include Peterborough Northern Star, Corby Town and AFC Rushden & Diamonds Academy. Atkin has also had successful stints managing Baston and ICA Sports in the Peterborough League.